A lawyer is obsessed with the belief that his family has been cursed by The Woman in Black. In an attempt to exorcise the evil, he employs a sceptical young actor to help recount his experiences, but then as the story unfolds – the boundary between reality and memory begin to merge making our The Woman in Black Theatre Breaks a very scary break indeed! This nail biting adaptation combines the power and intensity of live theatre with a cinematic quality inspired by the world of film noir. Stephen Mallatratt’s adaptation of Susan Hill’s 1983 novel is one of London’s most successful plays now in its 29th year of thrilling and scaring audiences. Midweek matinee performances can be rather dominated by school groups so an evening performance is the time to go for a more sophisticated crowd, and a more normal London theatre experience. However, “normal” is not a word to describe this remarkable production. With few props and scenery the cast of two manage to create a piece of theatre that is every bit as gripping as the finest movies or books of the film noir genre. If you are tired of musicals and comedies and want something with a little more oomph in it, then I can highly recommend booking The Woman In Black Theatre Breaks. 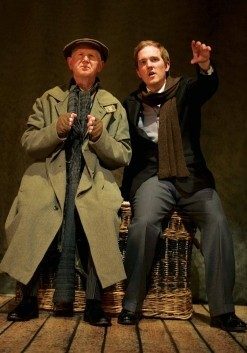 Susan Hill’s THE WOMAN IN BLACK at The Fortune Theatre, London now stars Terence Wilton as ‘Arthur Kipps’ and James Byng as ‘The Actor’. wow what a night. Proper scary theatre: I didn't think that was possible to make a whole room forget that it is only make-believe! Great acting and phenominal direction make it possible to create a world of suspense without the help of expensive scenery and special effects! “The Woman in Black” has been entertaining London audiences for many years. Matinees aren’t so good when you tend to be surrounded by students but even during those performances you can here a pin drop such is the suspense that the actors manage to conjor up. It is rare that a play sets out to scare its audience and even rarer that it actually manages to do so, but be warned The Woman in Black does both. It is great theatre and a refreshing break away from the classic West End musical.